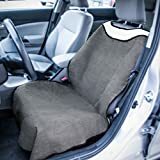 Protect your car seat from sweat after the gym or yoga session with the Sweat Towel Auto Seat Cover from OxGord, a premier manufacturer of automotive parts & accessories. Protect your interior: Our cover will keep your driver side or passenger seat nice and dry. It’s perfect for getting in your car, truck, van, or SUV when you’re all wet and sweaty after a hike, run, bike ride and any activity that makes you sweat. It’s also great for after swimming or a trip to the beach. Durable: Our seat cover is constructed from a strong and sturdy fabric that wicks away all moisture and water. It will retain its color and softness, even after you clean it. Smell fresh: Our cover prevents sweat from seeping into the upholstery and seating of your vehicle. By doing so it will stop bad odors in the tracks, so your car won’t smell like a locker room. Easy storage: You can quickly roll up our towel seat cover with the attached strap so you can conveniently store it in between uses. Quick installation: Our adjustable cover uses hook and loop fasteners to attach directly onto the seat. It’s compatible with seat belts and side airbags. Colors: Available in black and gray. See other OxGord products to fulfill all of your auto part & accessory needs. EASY STORAGE: Rolls up with the attached strap so you can store it in between uses. EASY INSTALLATION: Quickly clips onto the headrest. Low profile look for cars, SUV, trucks & vans. It’s compatible with side air bags and seat belts. MACHINE WASHABLE: Remove dirt and sweat simply by throwing it in the laundry machine. It’s also bacteria and odor resistant. ULTIMATE PROTECTION: Protect your seat and interior with this comfortable and durable fabric that wicks away moisture.